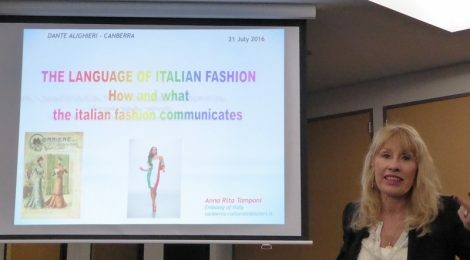 Our cultural event on 28 July 2016 was a fascinating presentation by the Director of Education and Culture at the Italian Embassy, Dr Anna Rita Tamponi, entitled The language of Italian fashion; How and what Italian fashion communicates. Dr Tamponi has a doctorate in, and has been a university teacher of, linguistics, and we all recognised the expertise that she brought to the subject. First, Dr Tamponi told us about the rise of the Italian fashion industry. It began in the 1920s and 1930s with small family businesses, including names such as Luisa Spagnoli, Gucci, Salvatore Ferragamo and Fendi. Then, in the 1950s and 60s the Italian economy grew rapidly, driven in part by the fashion and textile sectors. The Italian fashion industry blossomed, picking up on the casual but elegant style of Hollywood stars. In the 1960s, the boom in women’s independence led to a great change in women’s dress – miniskirts, bikinis on the beach, bright colours. The 1970s brought the growth of prêt-à-porter. Milan became a fashion capital. Giorgio Armani produced streamlined, modern, relaxed ready-to-wear ensembles for working women and men. The 1980s were an era of international success. Since 1990, following a successful marketing campaign, “Made in Italy” has become synonymous with style. In the Italian fashion industry today, there are huge numbers of famous names – the old names remain, but there are also many new ones, such as Benetton. Notwithstanding the spread of ready-to-wear fashion, alta moda (haute couture) is still alive and well, eg Valentino. Each fashion house has its own specific characteristics, making it recognisable in the fashion world. Dr Tamponi showed us video clips of two fashion shows, that had taken place only a couple of weeks earlier. The Fendi show was held at the Fontana di Trevi in Rome. (Fendi sponsored the restoration of the fountain.) Models on a transparent catwalk over the fountain appeared to walk on water. Dolce and Gabbana held its show at a number of different sites in Naples. Both shows used a cultural/historical background to create glamour embedded in Italian tradition. A living Italian icon – Sophia Loren – attended the Dolce and Gabbana show. Fashion is not just visual, Dr Tamponi told us. It is also verbal. The way we see fashion is conditioned by the words the fashion industry uses to describe it. Words and visual images are used together to create a mythical or illusory reality. Fashion uses cultural references to create, through words and images, atmosphere and judgements, eg ‘romantic’ (lace, embroidery), ‘traditional’ (classic cut, austere lines), ‘ethnic’ (brightly coloured, alternative). Dr Tamponi described for us some of the peculiarities of the (Italian) language of fashion, which she has studied in great depth. Here are just a few examples. Italian fashion uses a hybrid lexicon borrowed from other languages, eg “look”, “chic”, “haute couture”, “smoking. It transforms negative words into positive ones, eg mania, trasgressivo, eccentrico, veleno, aggressivo. It is hyperbolic, eg “divino tessuto”; “stoffa del potere e del peccato”. It uses metaphors (“la moda ondeggia sui tacchi”), similes (“si trucca come le bambole virtuali”) and metonymy (“il classico”, “lo sportivo”). It uses mostly impersonal verbs and also slogans – short sentences without verbs and with attractive key words. It invests objects with human or animal features, eg “la scarpa che respira”. The Italian language of fashion, Dr Tamponi said, is part of everyday life, and can be used in the teaching of Italian.